Martin Gilliespie, our next lecture speaker, has an unexpected work commitment overseas, so his colleague Paul Everett is stepping in. 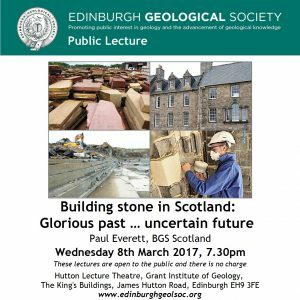 Looking forward to an interesting lecture, Building stone in Scotland: Glorious past … uncertain future. Natural stone has been a favoured building material since the early days of human habitation in Scotland, and is still in fashion for modern architecture. 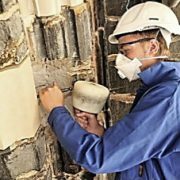 The Scottish building stone industry has bequeathed a rich and diverse legacy of stone-built structures that embody the historic fabric of our cities, dwellings, monuments, places of worship and infrastructure. StAnza, Scotland’s International Poetry Festival, takes place in St Andrews in early March. For Scotland’s Year of History, Heritage and Archaeology 2017, the Festival theme for this year is The Heights of Poetry, celebrating hills and mountains and asking how poetry can create and climb its own high places. In the Middle Ages, the Pilgrim Way crossed Fife heading for St Andrews Cathedral. Now each year people journey here for poetry. The second theme in 2017 is On the Road, and we’ll be looking at all manner of travel and journeys. 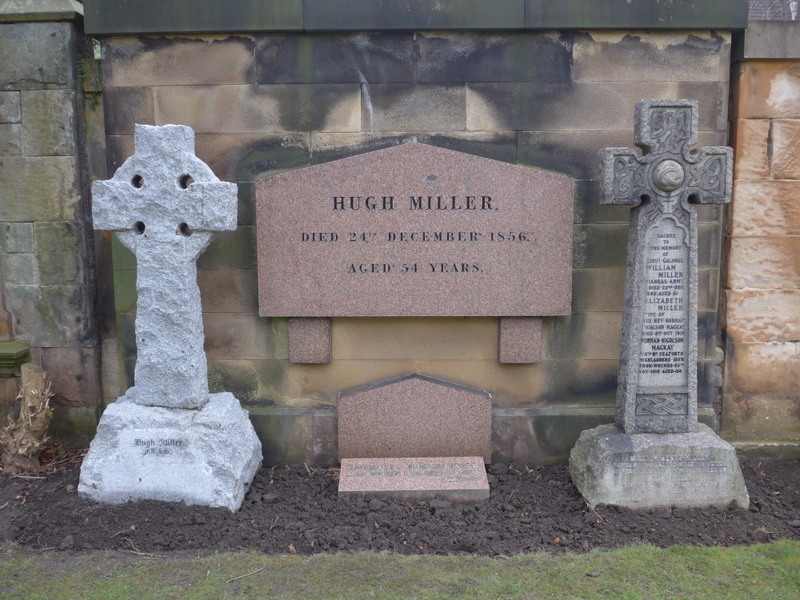 Lothian and Borders Geoconservation became concerned about Hugh Miller’s gravestone in the Grange Cemetery, which was becoming difficult to read especially in bright sunshine. 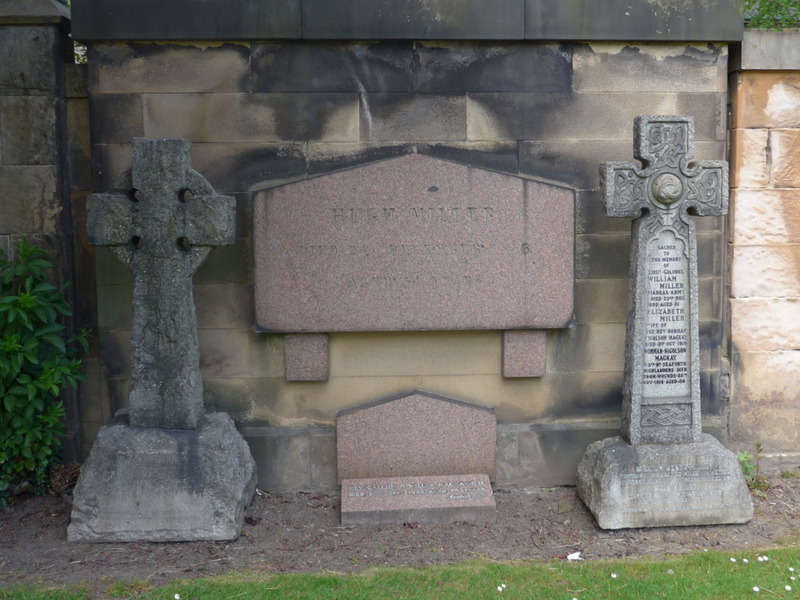 Andrew McMillan arranged for the gravestone to be cleaned and re-lettered so that the inscription is readable once again. At the same time we gave some attention to the stone for Hugh’s son (also called Hugh) which sits to the left of Hugh Senior’s stone. Although some of the lettering on Hugh Junior’s stone is too small to re-letter, the first two lines were done and the whole stone was cleaned up. You can see the results in the before and after photographs below. 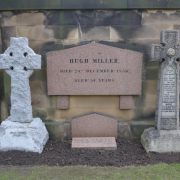 We are grateful for generous funding from Edinburgh U3A Geology Group and The Friends of Hugh Miller. In October 2015, the company that owned the Lochranza Centre decided to close it, saying there was no future in feldwork! Senior staﬀ and the local community have received wide support to create a new Community Interest Company to keep the Centre open and safeguard 14 jobs, 5 of which are held by geology graduates. The Centre is now thriving, and is open to any groups who want to come and experience at frst hand the geology and beauty of north Arran. We were co-hosts of the frst Arran Geofest in 2016 and are planning the next one in September 2017 – volunteers welcome! We are also working with partners including the Arran Heritage Museum and National Trust of Scotland to move towards UNESCO Global Geopark status in the next few years. 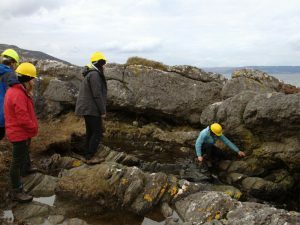 Come and experience Arran’s geological treasures: the dyke swarm of Kildonnan, the Drumadoon sill, the myriapod trail. 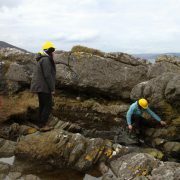 Contemplate process and time at Hutton’s Unconformity, only a 25 minute walk from the Lochranza Centre where a warm welcome, accommodation, refreshment and tuition await you and your party if needed. Stuart Blake, Director Lochranza Centre CIC 01770 830637.